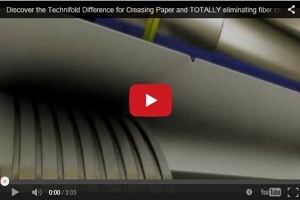 The Tri-Creaser™ EZ-Fit by Technifold is the World Leader in Creasing Solutions! Our Tri-Creaser™ EZ-Fit is the ultimate tool in rotary creasing technology and has evolved to become the World Leader in Creasing Solutions. Its simplistic design allows for instant perfection and ease of setting for light, medium and heavy paper stocks. Can be used to eliminate fiber cracking on both folding or scoring machines.